Home › Sociology › gender & feminism › Reminder: Submit for the Down Under Feminists Carnival! 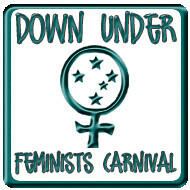 Reminder: Submit for the Down Under Feminists Carnival! Kiwis and Aussies, the deadline for the Third Down Under Feminists Carnival July edition is coming up at the end of the month! The carnival is scheduled to be published around the 5th August at Audrey and the Bad Apples. If you’ve written something feminist this month, or read something on an Australian or New Zealander blog that has appealed to your feminist sensibilities, submit it now! There are no limits on the number of submissions you can make. The blogcarnival.com submission form is here. – When you submit, it is useful if you choose a category, and write a brief description, perhaps with a pull-quote (a sentence or paragraph) that struck you. – Also make a note if there is a relevant image the carnival host could use as an illustration. – If you’re submitting someone else’s post, please put their blogname in the Name box, instead of your own. This helps the host immensely! We’re also looking for a host for the Sixth Edition, planned for 5th November. If you’re a feminist blogger (or a regular contributor at Hoyden and thinking of starting a blog! ), drop me a line via the Hoyden Contact form.